I never thought I’d bake bagels at home. Why bother when you can just buy a dozen from the store on Sunday morning? I’m from New York where we have access to some of THE BEST bagels in the world! After creating and testing hundreds of recipes for Artisan Sourdough Made Simple I had a change of heart. a.) you don’t have to knead it. b.) it’s so dry, you can basically shape it however you want. c.) if you mess up just let it rest and try again. And that boiling part you’re secretly dreading? 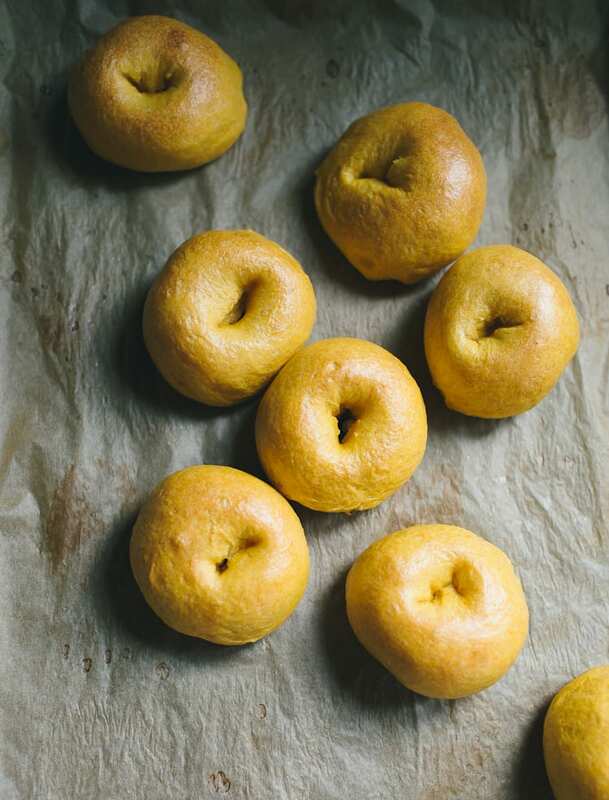 Yes, yes, yes, you need to boil the bagels prior to baking to set the crust… but it’s easy! If you can make ravioli you can boil bagels at home. So here we are, with a brand new recipe which is a twist on my Sunday Morning Bagels from the book. For this version, I added pumpkin puree to the dough. 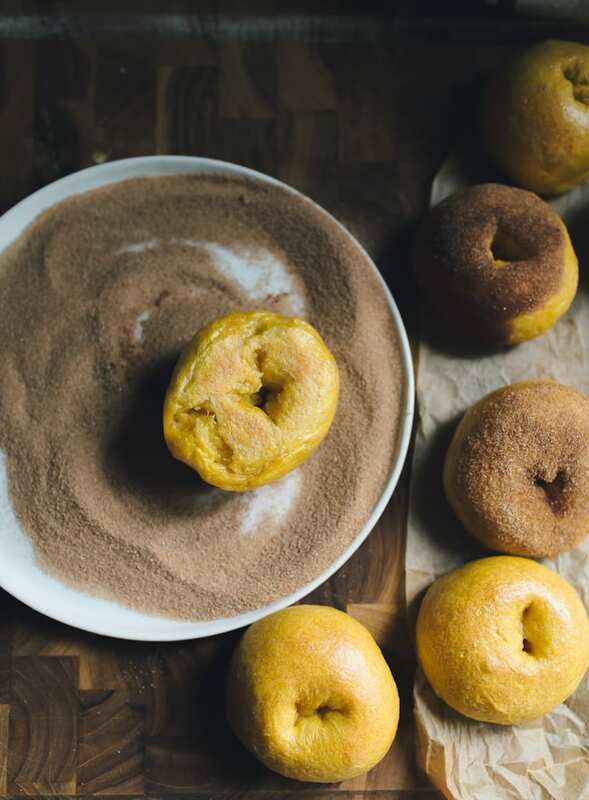 This doesn’t make the bagels taste like pumpkin, it’s more for color and autumnal ambiance. 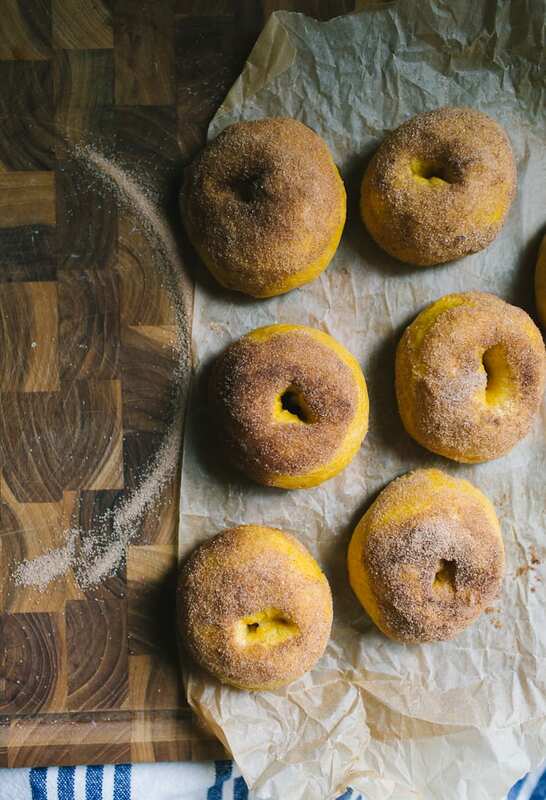 What really gives these bagels that quintessential pumpkin taste is the topping! 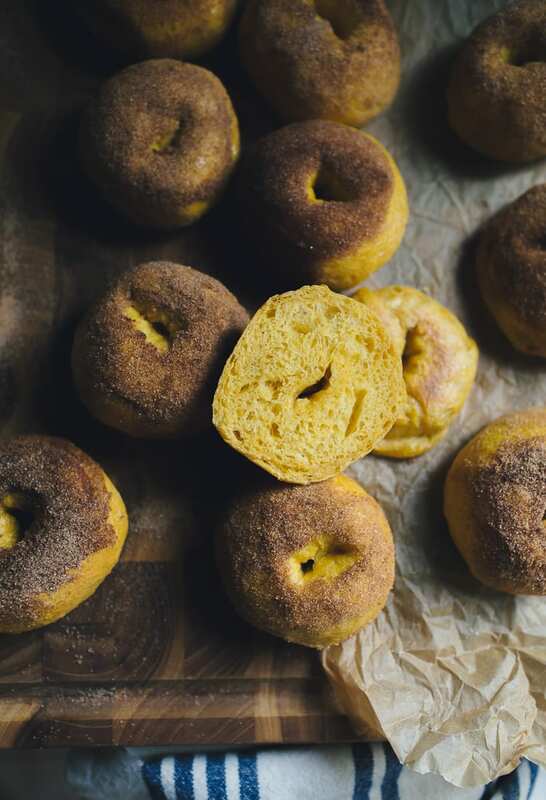 After the dough is boiled and baked, the bagels are lightly brushed with butter and dipped into a mixture of pumpkin spice and sugar. Also: these bagels are mini. Do I really need to say anything else?! It’s best to break this recipe up over two days: start the dough on Saturday evening, let rise overnight, and finish on Sunday morning. For overnight recipes, I’ll start mixing the dough anywhere between 5-8 PM the day before. In winter, I’ll make the dough between 5- 6 PM when I know it will take longer to rise. In spring and summer when the weather is warm and the dough will rise faster, I’ll push the start time to 7-8 PM, sometimes even 9 PM. You’ll have to play around this depending on where you live. 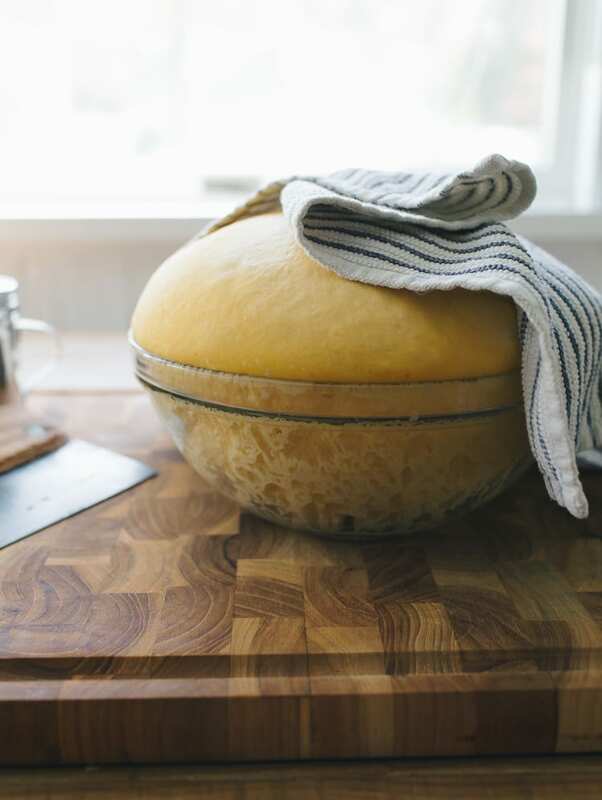 Either way, sourdough rise times will always depend on the temperature of your specific environment and the nature of how your starter performs- I cannot stress this enough. You’re not working with predictable rapid-rise yeast where the dough will be ready in 2 hours! Be patient. Flexible. And always watch the dough (not the clock). The next step is to remove the dough onto a non-floured surface. This dough is so dry, you don’t need any extra flour to prevent sticking. 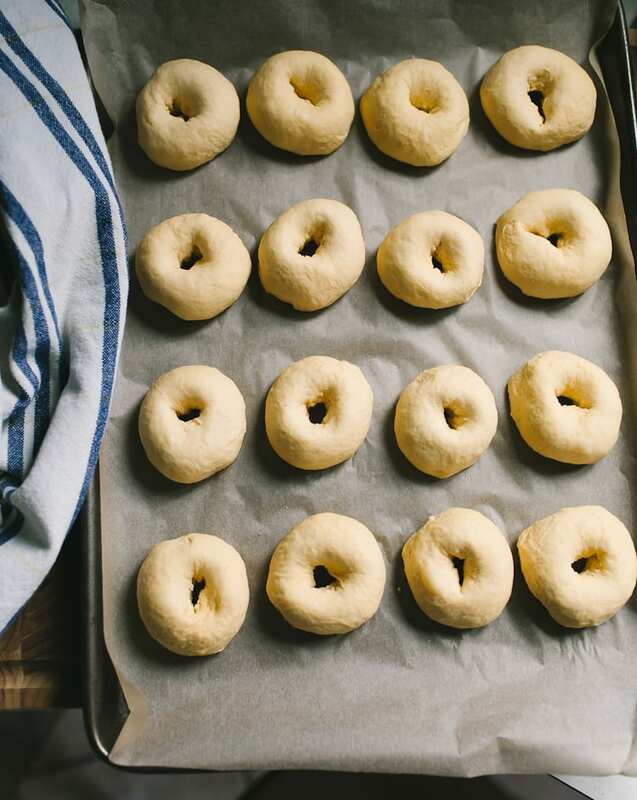 Cut the dough into 16 equal pieces for mini bagels. For best results, I highly suggest weighing the dough so that all of your bagels will be approximately the same size. Mine were about 57 g each. Note: if you prefer standard size bagels, cut the dough into 8 equal pieces or about 114 g each. Shaping bagels is a two step process. First, you’ll need to create little balls. Take one piece of dough and gather the ends towards the center (you can pinch them or push them down, if you want). 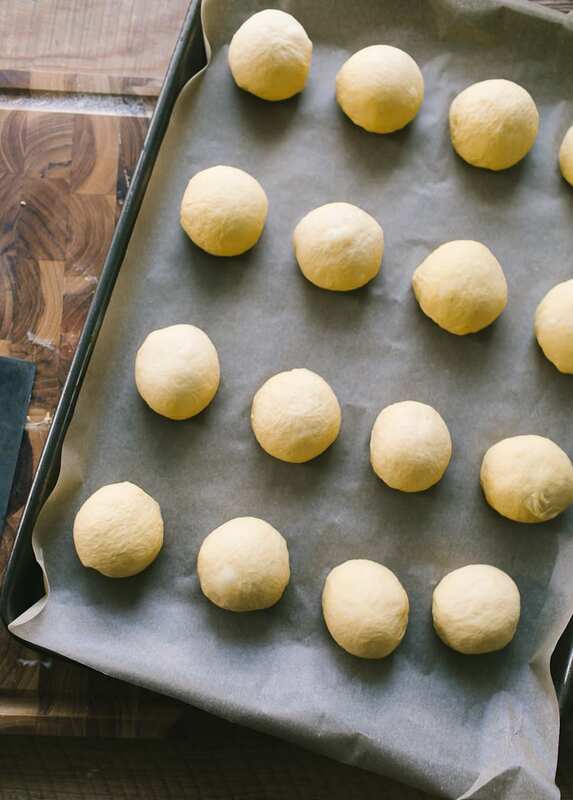 Flip the dough over, and then roll it into a ball using the palm of your hand. Place onto a parchment lined sheet pan lightly coated with cooking spray. Rest for 15+ minutes to relax the gluten. The second step is to create a bagel shape. To do this, poke your finger through the center of the dough. Then gently stretch the opening to about the size of a walnut. Place back onto the lined sheet pan. Rest for another 15-20 minutes. Meanwhile, bring a medium pot of water to a boil. Preheat your oven to 425 F. Line a second sheet pan with parchment paper and coat with cooking spray. Okay, so this is probably the scariest part for most of you. I totally get it. But don’t worry, it’s really easy. Once the bagels have finished resting, using your hands, gently lower 2-3 pieces into the boiling water- they won’t stick together. Reduce the heat to a rapid simmer if the boil is too high. Cook for 30 seconds on each side; I use tongs to easily flip them over. Then, using a slotted spoon transfer the bagels back onto the lined sheet pan you used earlier, rounded side up (the sheet pan will get wet). Make sure to have that second lined sheet pan ready for the rest of your bagels. By the way, it’s completely normal for your bagels to look bumpy and weird after you boil them. The surface will smooth out once they are baked. Isn’t that rich pumpkin color gorgeous? The next step is to pop the boiled dough into the oven. You can bake both trays at one time, however I prefer to alternate them on the center rack. 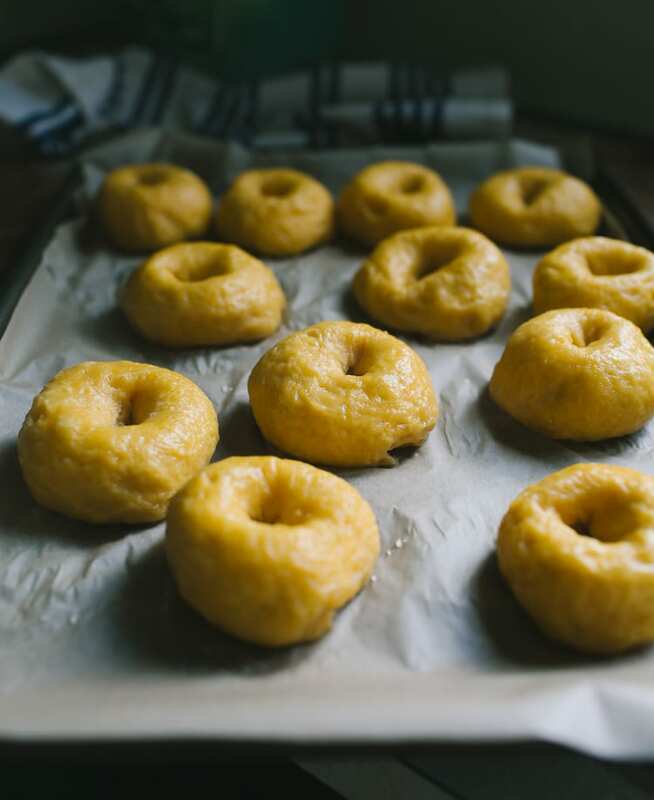 Baking time should run for about 16-18 minutes @ 425F for mini bagels. They should feel light and look lovely and golden when ready. Note: if you are baking 8 standard size bagels, increase the cooking time to 22-25 minutes. Meanwhile, melt some butter and set aside in a small bowl. 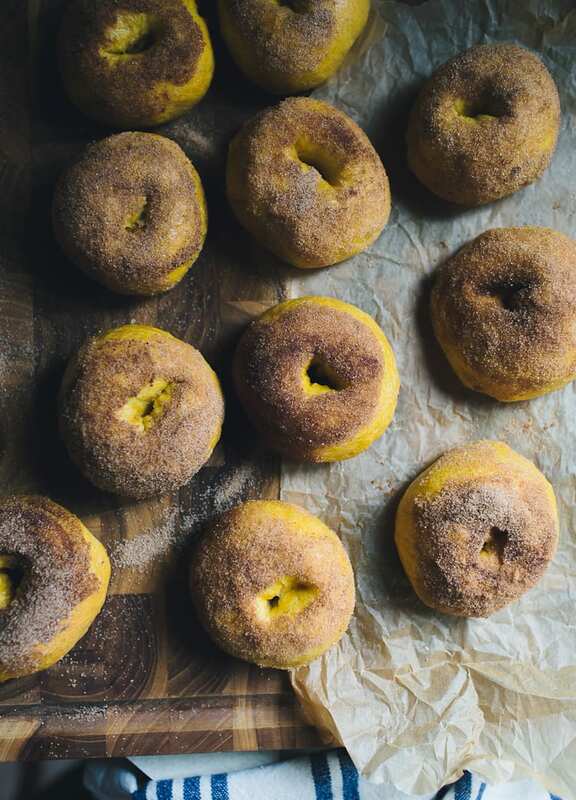 Combine about 1/2 cup of sugar and pumpkin spice (to taste) in a shallow bowl for your topping. So, working with one bagel at a time brush the rounded surface with some of the melted butter. Get the sides too. If you don’t have a brush, use a folded paper towel or napkin. Then roll and press the bagel into the sugar mixture. OMG! Don’t you just want to stick your finger in that sugar? These are soooooo good you have no idea! Seriously. Just wait until you try them! I ate one and completely burned my mouth but it was SO worth it! Here’s a shot of what the inside looks like… So soft and perfectly chewy! You can eat them plain, like little warm rolls straight from the oven. Or slice and serve with softened butter or cream cheese. Bagel dough is typically very stiff and dry. So, when you go to mix it by hand and it seems like a workout, you’re on the right track! Feel free to use a stand mixer if you have one. See recipe instructions below. When stretching out the center of each bagel to create a hole, it might shrink back slightly after resting. This is not a problem. Right before boiling them, gently re-stretch the opening and then lower into the water. If the bagels are boiled for too long, the crust will be thicker. I prefer about 30 seconds on each side (although I do not time this with a clock- just in my head!) and it creates a nice crispy, crackly crust. These bagels are best enjoyed FRESH! Eat them on the same day! Otherwise, the moisture from the sugar will soften the crust and they’re just not as good when that happens. Would it be helpful if I compiled a list of my favorite go-to tools for baking? For example, my favorite bread knife, flour brands, where to purchase a sourdough starter… etc? Please comment your thoughts below! This idea just popped into my head as I was wrapping up this post- thank you! Start in the evening: In a large bowl, add the starter, pumpkin puree, sugar, and water. Whisk with a fork to combine. Add the flour and salt. Continue mixing until the dough becomes stiff; then finish mixing by hand to fully incorporate the flour. Alternatively, combine the ingredients in a stand mixer and run on low speed for 4-6 minutes. Cover with a damp towel and let rest for 30 minutes to 1 hour. After the dough has rested, work it into a semi-smooth ball directly in the bowl, about 15-20 seconds. You’ll notice the dough is still stiff, but much softer than it was earlier. Cover with a damp towel and let rise overnight, about 10+ hours @ 68 F. The dough is ready when it has doubled in size. In the morning: Remove the dough onto a non-floured work surface. Flatten into a rectangle and cut into 16 equal pieces, about 57 g each for mini bagels (or 8 pieces, appx. 114g, for standard size bagels). 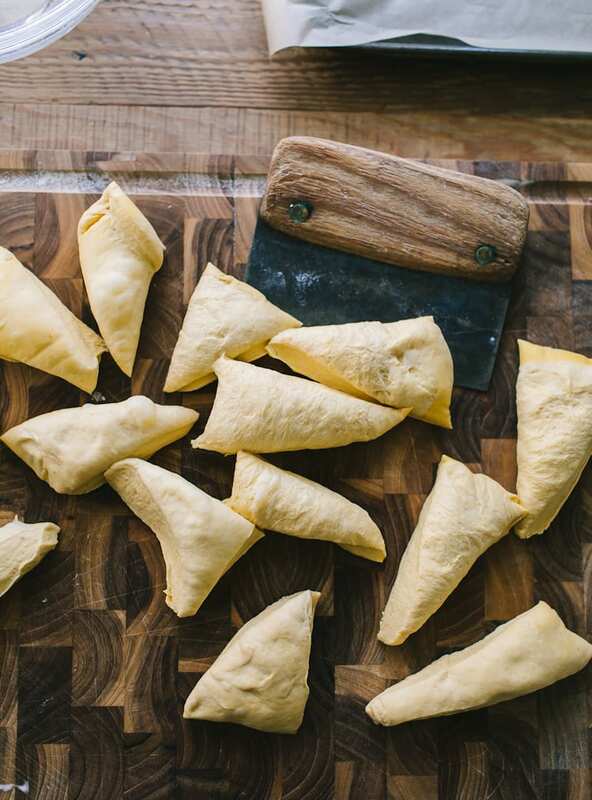 Working with one dough at a time, gather the ends toward the center, flip it over, and then roll into a ball using the palm of your hand. Place onto a parchment lined sheet pan lightly coated with cooking spray. Repeat with the remaining pieces of dough. Let rest for 15 minutes to relax the gluten. 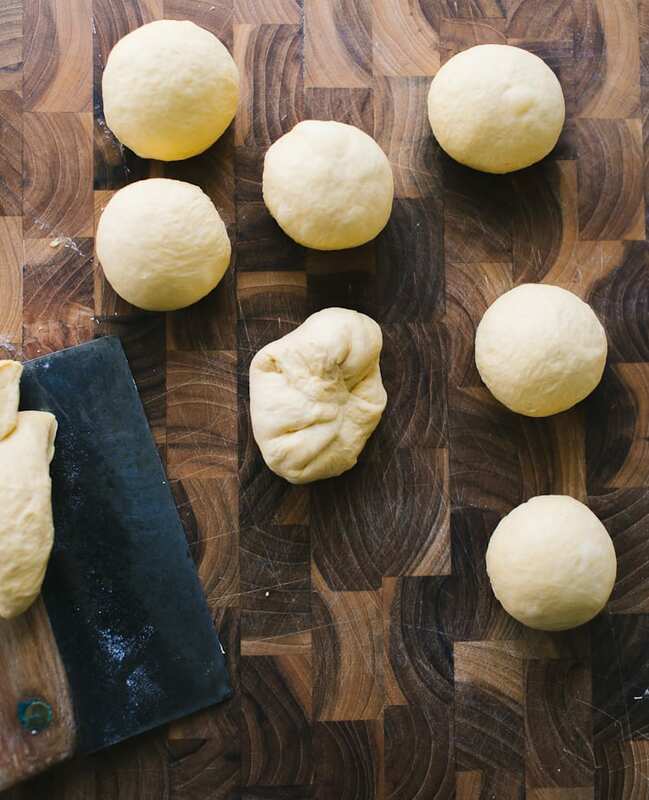 To shape into bagels, poke your finger through the center of each dough ball. Lift up the dough and stretch the opening to about the size of a walnut. Place back onto your sheet pan. Repeat with the remaining dough. Cover with a damp towel and let rest for 15- 20 minutes. Meanwhile, bring a medium pot of water to a boil. Add the honey and whisk to dissolve. Preheat your oven to 425 F (220 C). Line a second sheet pan with parchment paper and lightly coat with cooking spray. Add 2-3 bagels into the pot and wait for them to float; they will most likely float right away. If not, wait about 10 seconds or so. Simmer for 30 seconds on each side. Using a slotted spoon, transfer the bagels back onto the sheet pan you used earlier (you will also use the second lined sheet pan for this). Repeat boiling the rest of the bagels. Bake one sheet pan of bagels on the center rack for 16-18 minutes. The bagels should be golden brown and feel light to the touch when ready (22-25 minutes for standard size bagels). When finished, bake the second sheet pan. Meanwhile, melt the butter and set aside in a small bowl. Add the sugar and pumpkin spice (to taste) in a shallow bowl. When the bagels are cool enough to handle, brush the rounded surface and sides with some of the butter. Press the bagels into the sugar mixture to coat. Repeat with the rest of the bagels. Serve warm or at room temperature. These bagels are best served fresh. These bagels are best served fresh and eaten on the same day they are baked. Otherwise, the sugar will moisten the surface of the bagels. I’d really appreciate your tips. Especially bread flour brand–the brand I like seems to be discontinuing the bread flour, as I can’t find it anywhere anymore! I’d also appreciate starter brand recommendations. I tried to create a sourdough culture this week and failed. I’m either going to have to buy flakes or try again when it’s warmer and I have your book to guide me. How much flour is needed? I think it got left off the ingredients list. I am absolutely making these at the weekend. Love the recipes you keep sending is in the mail and yes could you post what tools and flour you use. Great question! Honestly, you can never fully predict how your starter will perform, but common sense tells me that yours should work perfectly fine as long as it’s fed at 100% hydration (equal parts flour + water by weight) . This way, the dough consistency will be correct which is important. It should feel dry and easy to work with. Regarding flavor, I’ve had these bagels taste ‘sweet’ on some days and more tangy on others. Sourdough flavor depends a lot on how the dough was fermented in addition to the makeup of the starter itself. Hope this makes sense! I LOVe sourdough! It’s the way to go of eating bread. Getting the starter has always scared me away from the whole recipe process. I’d love your feedback and your enthusiasm to help me try. Hi Dehanna! I completely agree! Regarding sourdough starters, it’s always the most intimidating part of the process because it’s mostly misunderstood (in my opinion). For that reason, I go into quite a bit of detail in my book to explain the process in a way that’s easier to digest (literally!). So, you can begin your journey there and create your own starter, or if you know someone with an already established starter maybe they will share theirs with you! I’m selling mine in small batches- please send me an email if you’re interested. I’m new to sourdough so a list of your favorite items would definitely be helpful. I’m making your overnight cranberry pecan sourdough loaf for our thanksgiving dinner. Yes! 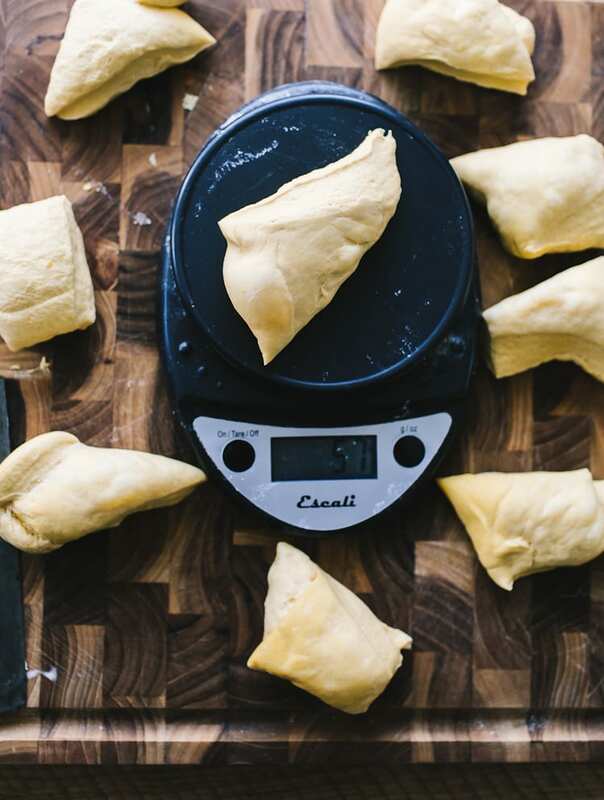 I would love for you to compile a list of your favorite go-to tools for baking. And every recipe of yours that I have tried has turned out beautifully and is so delicious. I love that you use weight measurements and that you use common every-day ingredients and that your directions are so well presented! Your work is such a pleasure to follow. Thank you! You make it look so easy (and delicious)! I’ve only attempted bagels once before and I’m ashamed to say it really didn’t work out too well. Thanks for sharing such a detailed guide with images – really helps to know where I’m at at every stage! Also, I’m glad to hear that it’s normal for them to look a little odd after the boiling stage – that should save some worrying when I make them!! I just wanted to ask what if we don’t have pumpkin purée? Do we just substitute for more flour instead? 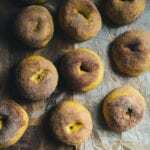 You can certainly leave out the pumpkin puree if you wanted to make plain sourdough bagels. I wouldn’t substitute more flour however (pumpkin puree replaces some of the liquid). Simply use 250 g warm water instead. Enjoy! I just made the Pumpkin spiced bagels recipe. It was easy and turned out great. Very tasty bagels. I like all the helpful hints you give with all your recipes. Thank you for this wonderful recipe of bagels. I have tried so many different versions but not very successfully. These ones came out just perfect. And in the second lot, I added my own twist. Instead of pumpkin, I used strawberry puree and made sweet bagels. My daughter just loved them. Thank you again. What do you do with the dissolved honey? For all of your recipes could I use a 1:1 gluten free sub or would it give me a different result? Thanks! I haven’t tested this myself, so I’m unable to advise. I would experiment and see what happens. Good luck! Is there a way to make this recipe just with east and not with sourdough starter?